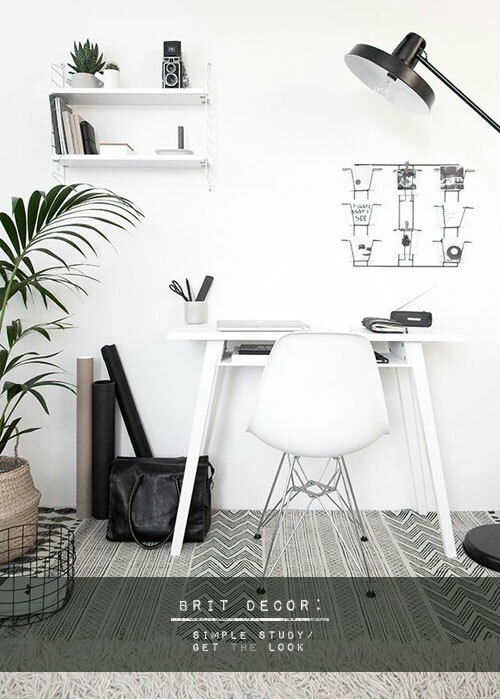 The formula for re-creating an uber-cool minimalist workstation at home is as simple as the 'look' itself. My advice to clients is always the same when it comes to workspaces; keep it simple. 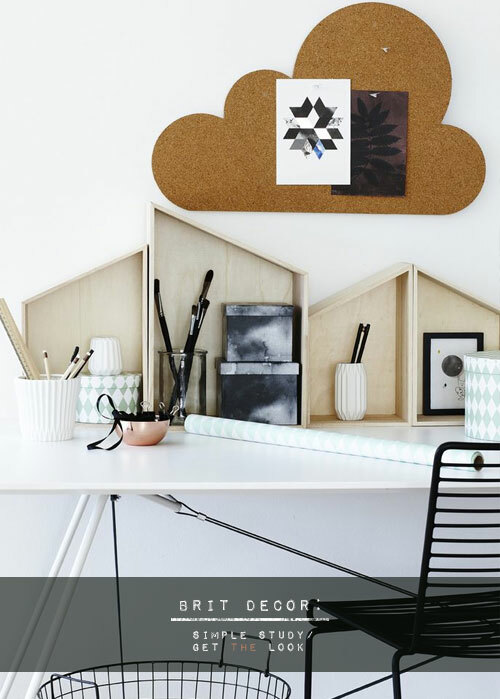 Making the decorative scheme too complicated or over-accessorising a desk can have a negative impact on both productivity and creativity, even for those of us who aren't easily distracted. I prefer to begin with a simple palette and then 'layer-up' the scheme with personal touches such as prints and desktop accessories. I have chosen the 'above' schemes today because of their simplistic styling and watered-down monochrome palette. 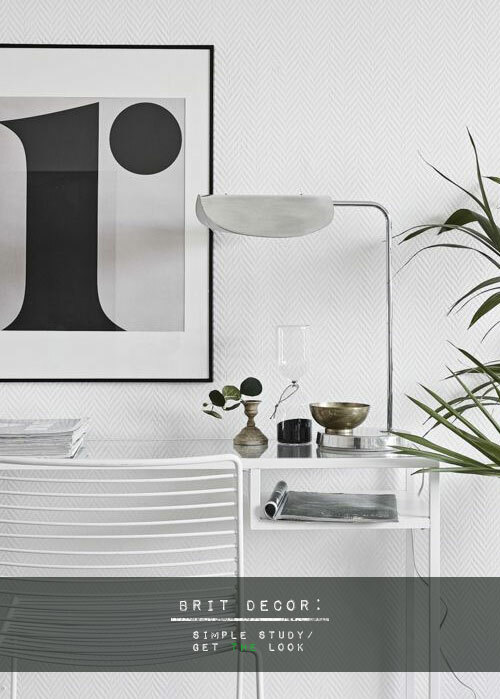 Whilst the monochromatic trend has continued into 2015, there's now a tendency for white to be the dominant colour, with the darker of the two taking a back seat. Houseplants can be applied to bring architectural height and subtle green colouring, not forgetting an air of clam too. 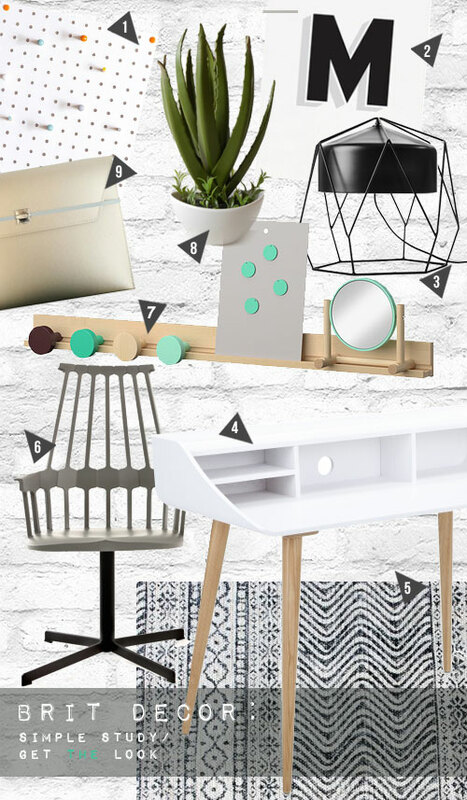 If you are not enamoured with the prospect of caring for plants in your workspace, there are plenty of artificial options that don't compromise on style (see no.8 on my shopping picks 'below) yes it's true! Gold and copper accessories and plywood materials are great for bringing a hint of warmth. The subtle white and palest grey chevron wallpaper in image 2 'above' creates the illusion of texture, and the sharply defined black metal frame of the typographic print adds a clear focal point. It's also easy enough to create your own wallpaper (of sorts) with a simple notice or pin board adorned with your favourite prints and images (see no.1 'below) - this also means that you can constantly change your style depending on mood, season, or just for the fun of it. The all-important task lighting is another area where style need not be compromised in order to get the job done. Metallics are red hot - matt finishes can give a smooth pastel look whilst glossy surfaces bring an air of luxe-glamour. Personally I'm a big fan of desktop lighting, but it's hard to ignore the the slightly epic statuesque angle poise floor lamp featured in image no.1 'above'. The final point to consider is the comfort factor - yes workspaces should be comfortable too! In reality a large number of the most stylish chairs don't necessarily provide vital back support, in which case, cushions can be drafted in to help compliment the scheme and add a relaxed feel. Equally, I find there is something quite liberating about the feel of kicking off my shoes and the feel of soft textiles underfoot when I'm sitting at my desk, and I am a huge fan of the 'Sketch' rug from Rockett St George (no.5 'below'). Happy working - we deserve it!